Career & Placement - MACC - The college for you. This resource center/computer lab provides FREE services to anyone residing in Northeastern Missouri desiring career direction. Because no classes are scheduled in the computer lab, it is accessible to students throughout the day. The computers are equipped with Windows 7, Office 2013 Professional Suite, WinWay Resume, CareerScope, Plato and software specific to some classes. The machines are all linked to the Internet and a laser printer. Resources include a variety of career related videos, audiocassettes, CD-ROMS, books, periodicals, free leaflets and brochures, free resume paper, and a variety of vocational assessments. College Central Network is MACC’s customized online recruiting service. 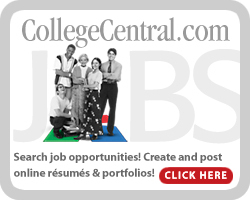 College Central Network gives employers the capability of posting employment and internship opportunities that will reach hundreds of students in the Moberly Area Community College service region. Students may register, post resumes online, target and customize their job searches and have access to thousands of local, regional, and nationwide employment and internship opportunities. Missouri Connections is an internet-based, comprehensive career development system supported by the Missouri Department of Elementary and Secondary Education. This program features seamless content on a variety of occupations, degree and certificate programs, colleges and universities, financial aid, self-employment, military options and more. Special features for students and career planners include career planning portfolios, course planners, resume writer, employment interviewing skills, occupational videos, and a variety of vocational assessments and exploration tools. Missouri Connections includes interests, values, and skills assessments as well as activities that enrich self-knowledge, encourage exploration, and facilitate goal-setting. First log in with the Guest User Name and Password, then click on "Create My Portfolio" on the upper right portion of the page to create your own account to save your searches and assessment results. Services to employers include job postings on our online College Central Network as well as our on-site bulletin board, annual College, Career & Health Fair and referrals to job openings. The Director of Career & Technical Education Data & Student Success provides career education, vocational assessment, self-management skills training, and occupational information support in addition to job placement assistance to students and alumni, internship assistance, employer information and job search skills training. She administers the New Traditions Program and is available by appointment at the Moberly Campus and at MACC off-campus sites by appointment. Contact Sonda Stuart in the Career Center, Room C02, at 660-263-4110 ext 11232. The Career Specialist provides information and orientation, assists students with computers and multimedia resources, schedules tutors, and schedules appointments with the Director of Career & Technical Education Data & Student Success. Contact Elaine Avery at 660-263-4110 ext 11319. Year-Round, Monday - Friday, 8:00 a.m. to 5:00 p.m. Some evening hours by appointment.